A while back, I had an early flight to catch for Paris and was going to be away for two weeks. I had only been back to Florence for a short time and felt like I hadn’t experienced enough of her before my departure the next day. On the morning of my flight, I woke up an hour earlier so I could walk around Florence and say goodbye to her. By the time, I reached Ponte alle Grazie, the sun hadn’t even risen yet. I stood along the low brick wall and decided to watch the sunrise. A great sense of serenity came over me as I listened to the water flowing over the weir in the Arno and observed the birds flying overhead. My initial plan was to walk around, but instead I just stood there mesmerized by the colors in the sky as they changed from deep magenta to light pink and then orange. With each passing minute, the colors became even more vibrant. I probably took about fifty photos from that one spot even though I only published one of them on Instagram. I knew that I couldn’t share my entire experience of viewing the sunrise, but I could show the magic of that sunrise. Ever since that day, I promised myself that I would take time out of my day to be present with Florence. 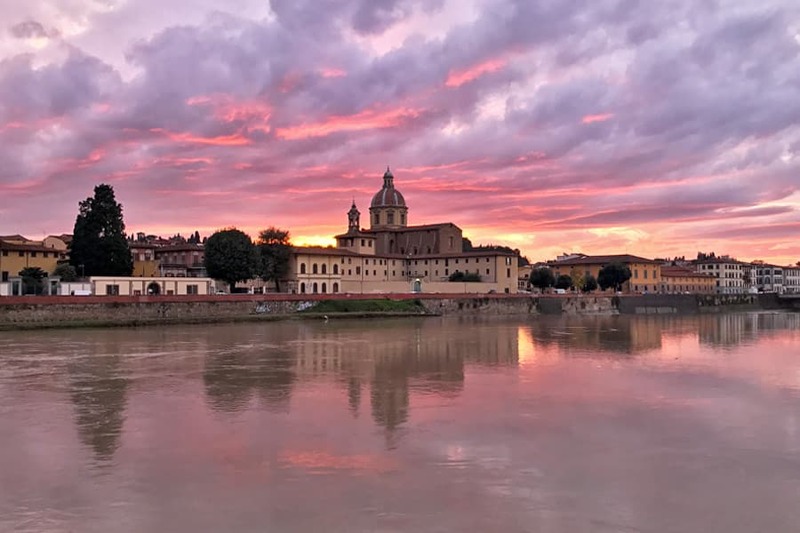 Not just at sunrise to take advantage of the peaceful moments along the Arno or at sunset when I get to give thanks for my day, but also throughout my day too. Just standing in one spot to bask in her beauty is one of my greatest pleasures. When I go to the gardens, visit museums, sit in churches, or just walk around the city, I’m not constantly taking photos of Florence. My intention is to stay as present as possible with her. I let Florence lead the way so she can unveil even more of her beauty to me. I don't scour the city for some unique view; I allow Florence to reveal another aspect of her beauty that I hadn’t noticed before. Even though I’ve seen much of the city over and over again, I’m always overjoyed when I see something in a different way that delights me. 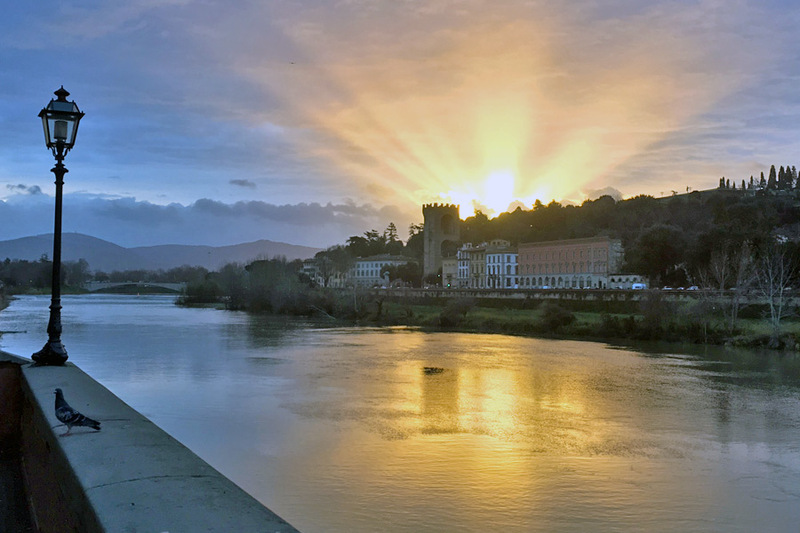 Anything can catch my eye: the way the sun shines through the leaves of a tree, the delightful mix of colors in the sky, the reflections mirrored on the Arno, the long shadows beaming across a narrow street, or the patterns of the clouds in the sky. Being present with Florence doesn’t allow me to just enjoy her, but to savor her. Florence is undeniably beautiful, but when Mother Nature unites with her, she becomes magical. Her beauty is exalted in ways that you must see to believe. Many people tell me I’m lucky to live in Florence. I’m not fortunate for choosing a beautiful city to live; I’m fortunate for being open to Florence’s magic so I can witness more and more of her magnificence every day and truly appreciate it.